What is "Bleed" ? and why every Printing Job need Bleed. 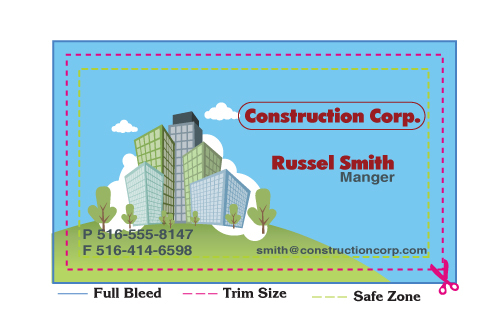 "Bleed" is a printing term used to indicate the portion of the card that will be Trimmed Off when cut to the final size. The purpose of a bleed is to continue a color, image or design to the edge of the card. Please help us in making this page streamlined for your needs by filling out the form below. Each comment will be reviewed and used for future updates. The margins between the trim line (red line) and the dimensions of your artwork is call "Full Bleed"
images and text outside the Trim line (red line) will be CUT-OFF! Any photos, colored background or images that you want to continue to the edge of the products must be continued past the trim line (red line) to at least 1 mm of each side. This is the finished size of the products after cutting off the "Bleed". Text or images that next to the trim line (red line) MAY BE CUT-OFF! We also recommend no borders due to shifting in the cutting process, borders may appear uneven. All critical elements ( text, images, logos, etc.) MUST be kept inside this area. Anything left outside this box may be CUT-OFF during trimming. There is no extra charge for full bleed. Below is the guideline which helping you to set your file size. Please kindly follow the instruction when creating your artwork. Business card 3.75" x 2.25" 3.5" x 2" 3.25" x 1.75"
Postcard 6.25" x 4.25" 6"x 4" 5.75" x 3.75"
5.25" x 7.25" 5" x 7" 4.75" x 6.75"
5.75" x 8.75" 5.50" x 8.5" 5.25" x 8.25"
Letterhead 8.75"x 11.25" 8.5" x 11" 8.25" x 10.75"
Brochure 11.25" x 17.25" 11" x 17" 10.75" x 16.75"
8.5.25" x 14.25" 8.5" x 14" 8.25" x 13.75"
8.75" x 11.25" 8.5" x 11" 8.25" x 10.75"
Restaurant Menu 11.25" x 17.25" 11" x 17" 10.75" x 16.75"
Flyer 11.25" x 17.25" 11" x 17" 10.75" x 16.75"